Subject matter theory and research expert - best practices in online/hybrid instruction. Technical instruction - computer troubleshooting, installation, servers, routers, switches. I will provide my certification of your learning and you can use me as a reference. Business communication - clear, precise, professional business writing; public speaking; document design; websites. Designed and provided instruction Microsoft Access via GoToMeeting software to the staff of Century 21. The staff was provided with a reference video of the instruction as well as documentation for future reference. 7 years of instruction in Microsoft Excel Spreadsheet Modeling via hybrid course format at Montclair State University. Published academic research was carried out to understand the advantages and disadvantages of face to face vs. online instruction. 3 years instructor of data analysis, interpretation and communication, i.e., how to make practical decisions based on numbers and how to effectively persuade a given interpretation. $125 per hour, not per student - have as many people as you want get instruction per hour. Dissertation: Structural Parameters of Information System Success: Hierarchy, Leadership, Politics and Socio-technical Sub-systems. Current research: Approaches to Student Motivation and Learning Strategy: The Role and Value of Different Approaches in Modeling Outcomes in a Hybrid Class. The Paradigm Shift in Organization Studies, Yanli Zhang*, Yawei Wang, William Colucci, Zhongxian Wang, International Journal of Data Analysis Techniques and Strategies, 2011. Impact of the Placement and Quality of Face-to-Face Meetings in a Hybrid Distance Learning Course, William Colucci and Nicole Koppel, American Journal of Business Education, February 2010. Approaches to student motivation and learning strategy: The role and value of different approaches in modeling outcomes in a hybrid class, Academy of Business conference, New Orleans, March, 2013. From the Tower of Babel to CSI: What are the modern stories about technology telling us? –A look at TV science fiction and detectives shows, New Jersey Communication Association, College of St. Elizabeth, 2010. Impact of Face to Face meetings in a Hybrid Distance Education Course, Clute Institute, Las Vegas, 2009 (session Chair). Reflecting on the Scholarly Culture of Communication Studies: Connecting With Each Other, Students and the Public, New Jersey Communication Association Conference, March 2005 (panel session organizer). Social Information Processing Theory Conceptualization and Specification for an Evolving Job Characteristics Model, International Communication Association, New York, 2005. A Communication Structure Approach to Explaining Information System Implementation Outcomes, New Jersey Communication Association, 8th Annual Conference, 2004. Structural Factors in Information System Implementation: Hierarchy, Leadership, and Organizational Politics, International Communication Association, 2003. The Effects of Participative Work Systems in the Pharmaceutical Industry on Employee Attitudes and Communication Networks, New York State Communication Association, 2001 Network Evidence in a Recursive View of the Field of Mass Communication, International Communication Association, 1997. Writing undergraduate text materials to support teaching about the interpretation and communication with and about numbers, statistics, data analysis. Created course materials, assignments, assessments, online tools and procedures for courses. Fellow and Research Fellow, Engaged Teaching Fellows Program, 2011-2016. Provided leadership among faculty in coordination of multi-section courses. Presented course re-design in the University Learning and Teaching Showcase, May 2011. Montclair State University Provost's Series on University Teaching and Learning. Summer symposium on technology and instructional design, June 2009, hosted by Montclair State University Office of Information Technology. Innovations in Education Colloquium, Stony Brook University, NY, May 2009. Curriculum development for data analysis and communication, and spreadsheet modeling courses. "William is a role model for the kids of interdisciplinary, cross-disciplinary and collaborative work that are the hallmarks of fine pedagogical and scholarly work. While we are in different colleges within our university, William and I had an easy time of finding common ground and shared vocabulary to work together on innovative projects. William is well-spoken, diligent and creative and a team player. He will quickly find his place wherever he works." "I have worked with Bill Colucci for several years now in various programs and on various projects. It has always been a treat to work with him: he is very professional, timely, open to new ideas, and follows through on all parts of our joint projects. He's a great listener and thinker and has taken the initiative in coming up with solutions to any challenges that come along; in the classroom or as part of a large state university. I highly recommend him." 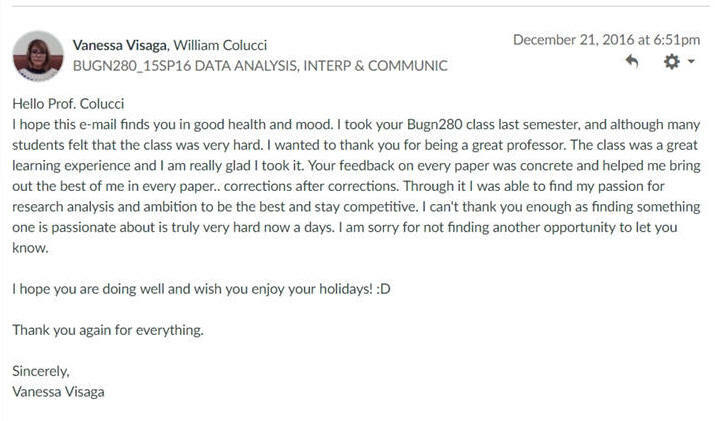 "Dr. William Colucci is a professor of Spreadsheet Modeling at the School of Business; his courses are taught both in-person and online. He has done a terrific job on online learning methods and continues to strive to better teach his students. I would highly recommend Dr. Colucci, I have complete faith that he will continue to provide positive contribution to any school and department. " "I am writing this letter showing my support of Dr. William Colucci for a faculty position and to summarize my experience with Bill. We have known each other for approximately four years and had worked together for one and a half years at Montclair State University’s Feliciano School of Business. As part of any faculty team, Bill would offer extensive training and development skills to draw on. For example, Dr. Colucci’s created a course design which was linked to each chapter. Students were tasked with taking any element of the chapter that they found interesting and finding an article, video, etc. which related to that chapter. They were required to write a brief response to three questions and were tasked with presenting these in class. This course design achieves the following: · Provides extensive exposure to good communication, practice interpreting, and evaluating, and articulating views in public dialogue · Enhances business communication skills, both written and oral. · Use of current articles provides a sense of the relevance of course material and the value of learning. These benefits have actually been articulated by students as they formally comment on course quality. Bill is an intelligent and hard-working team player. In addition, he is an accomplished speaker and, as a teacher, goes the extra step to deliver his expertise to his students. Your organization would find Dr. William Colucci a stellar asset." "I had the pleasure of working with William on many CRM projects which involved complicated Network Setups. I always found William a pleasure to work with and admired his work." "Bill is a tremendously talented Network Administrator and made significant contributions while individually overseeing a 50-user Microsoft network during the 3 years I managed him directly at Media Bay. Bill handled everything from hardware procurement and software installations to performance optimization and help desk support. Bill developed strong working relationships with everyone in the company, including the entire executive team, and always delivered great results with a smile. Bill demonstrated good judgment in balancing multiple priorities and was extraordinarily self-motivated to continually improve his network skillset. Bill is a very reliable asset and solid contributor on any team!" "Yes, Bill is a tremendous network administrator, but what sets him apart is his ability to connect with and understand his "clients". The art of listening is often a lost art form, but Bill truly listens to his "clients" to truly understand the need or want. This has allowed Bill to solve, correct and/oror address this issue at hand the first time around. This skillset has done him well as he has moved into the academic field. Bill listens to not only his students, but also to what the marketplace tells him he needs to teach to his students. Any student coming out of Bill's classroom will be ready to apply his/her learnings on day one because of Bill's insight to the marketplace's demands and what his students are looking to add to their own skillsets. If I was ever going back to school again, I would seek out and enroll in Bill's classes. So, if you need an experience network administrator or a college professor teaching computer science, look no further than Bill. He will exceed any expectations - by a mile. " Students in a business survey course doing an end of semester presentation of a new product idea for investors, a la "Shark Tank"